through this Assam NHM recruitment 2019. Candidates who are qualified GNM Course or B.Sc Nursing Degree they are eligible for applying this NHM Assam Staff Nurse Vacancy. 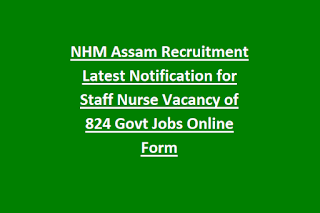 Candidates can apply online for this NHM Assam Staff Nurse Jobs on 25-03-2019. 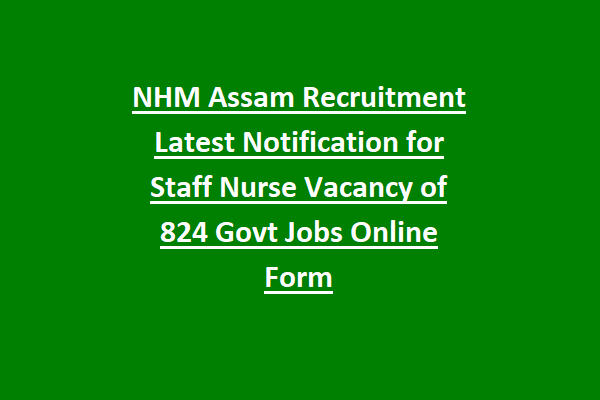 Complete information about this Directorate of Health Service NHM Assam Staff Nurse Recruitment 2019 application process, age limits, selection procedure is given below. There are total 824 Staff Nurse jobs in this National Health Mission, District Health Services and Govt Medical Colleges & Hospitals recruitment 2019. As on 31-12-2019 upper age limit for SC/STP/OBC/MOBC candidate is 49 years and for all other 18-44 years. Candidate must have qualified B.SC Nursing or GNM Diploma course. And must have registered with Assam Nursing Council. Candidates will be selected purely based on their merit in GNM/B.Sc Nursing Courses and SSC, HSLC. District wise merit list will be prepared. Based on this merit list candidates will be called for document verification. At the time of attending the document verification candidates must have produce the original documents and photo copies. After document verification a final list of selected candidate will be displayed in NHM Assam official website or dhs.assam.gov.in. Documents which are produced at the time of verification are given below. If large number of applications received a Selection will be conducted followed by documents verification and interview. Interested candidates apply online for this Staff Nurse Jobs on or before 25-03-2019. Official website to apply online is www.nhm.assam.gov.in.